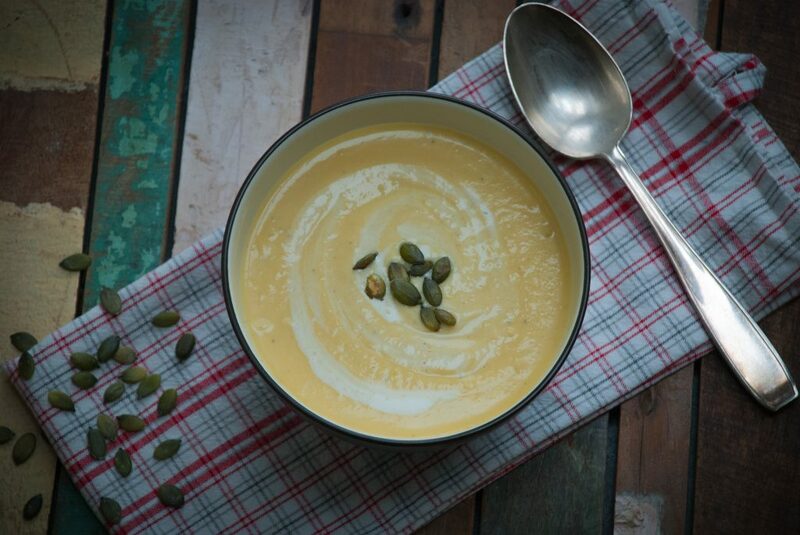 I just love this season, when the nature is full of colors and the temperatures are slowly dropping: It’s soup time again! And I like to experiment with the harvest of our garden. Ok, true, this year our garden was not really the main object of our desire, but nevertheless we have quite a lot of apples and some butternut pumpkins. So, I just wanted to try if the two of them would harmonize together in a soup. 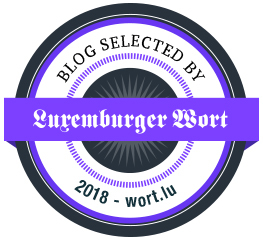 And I have to admit, that I am quite satisfied with my result! 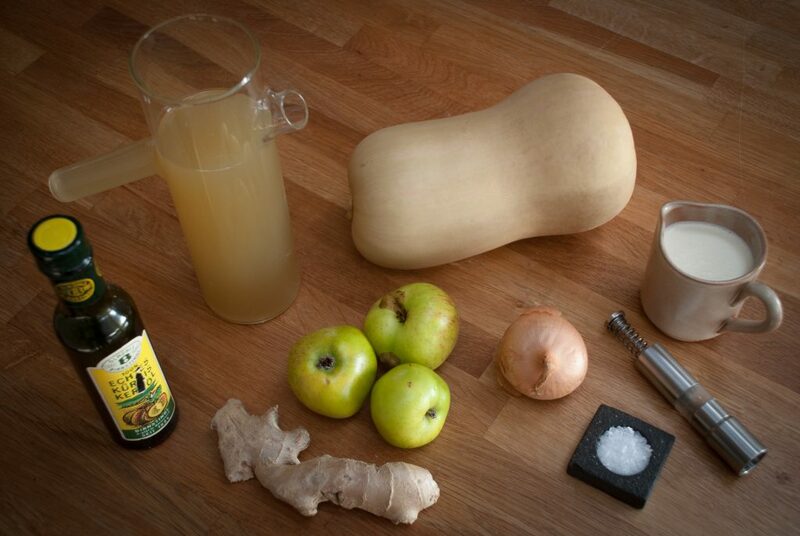 So here’s my recipe for the butternut pumpkin and apple soup. You do not need to be afraid of pumpkins, doesn’t matter which kind you use! It is such an “easy” vegetable to use for soups. Now this year I chose to seed some butternut pumpkin and so it’s the first time I am cooking them. 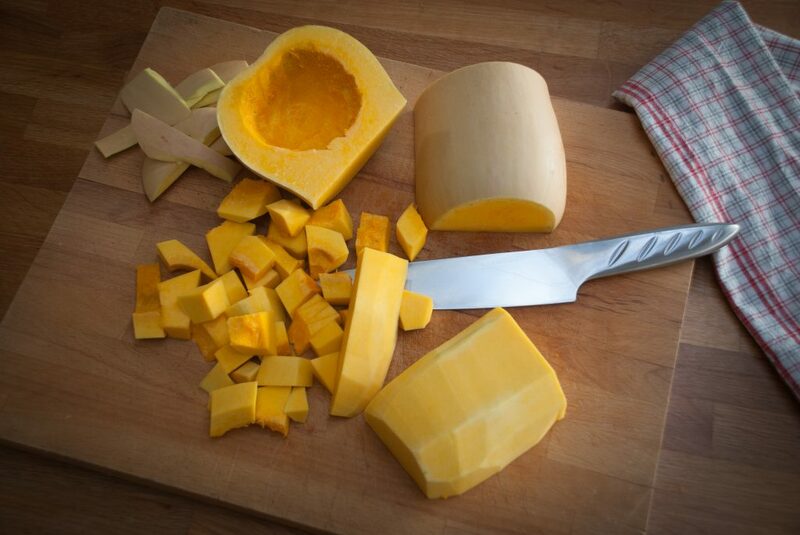 The butternut has the form of a pear and the color of its shell, which is NOT edible, is lightly yellow and either smooth or popped. Its light orange and tender squash has a sweet, buttery flavor. And it does not have so many seeds as other pumpkin sorts. Start with the preparing of the pumpkin. 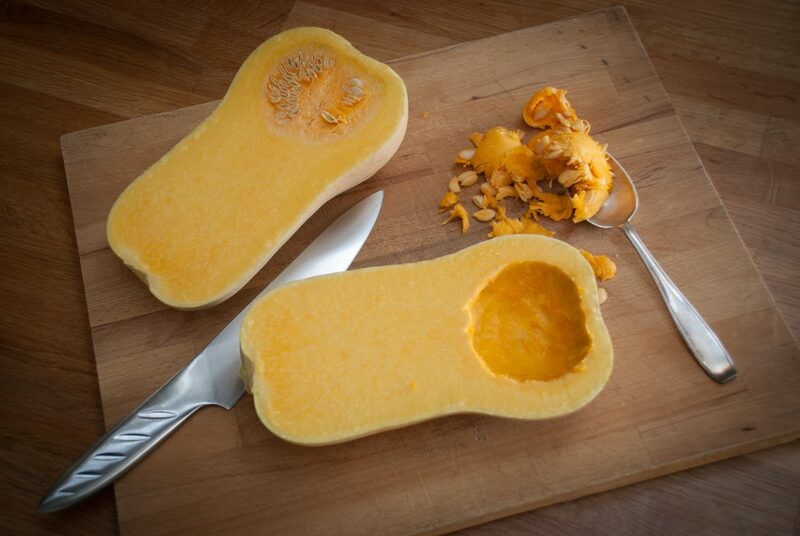 First halve the butternut in its length with a long kitchen knife, then you can hollow out the seeds with the mellow squash. Then cut the 2 halves in 2, before cautiously peeling them and cutting the rest into cubes. Now you can peel the onion and chop it finely. Pour the pumpkin seed oil into a cooking pot. Fry the onion until it becomes translucent. Add the ginger and fry for another minute. In the meanwhile, peel the apples and cut them in 8. 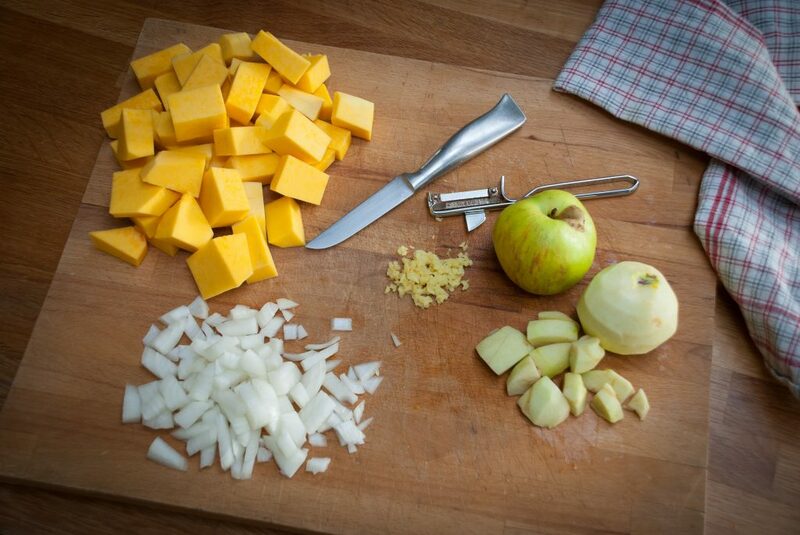 Now add the butternut squash and the pealed apples in the cooking pot and fry for another 5 minutes before adding the chicken stock and bring to boil. Once boiling, turn down the head and let it simmer for about 15 minutes until the butternut squash is soft. Let the mixture cool down a bit before using a bar mixer to blend it into a smooth soup. You can also use a blender for this step. Pour the fresh cream in it and season with salt and pepper. 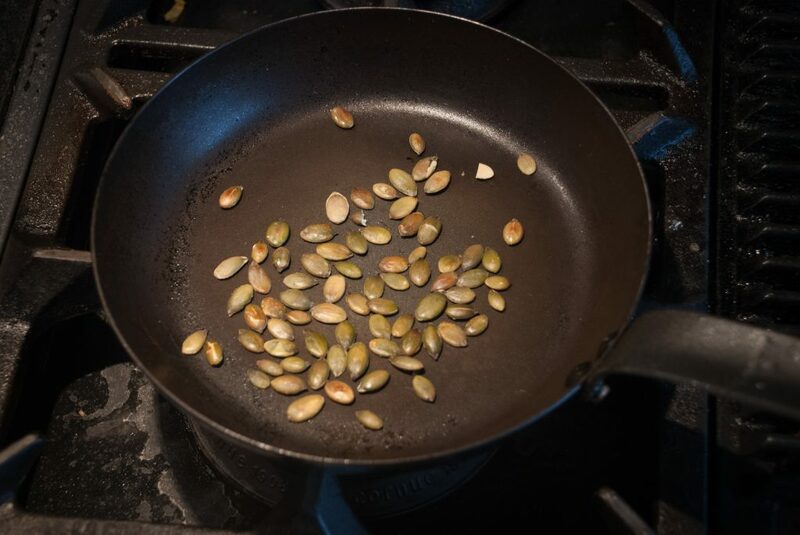 For the crispy presentation, heat up a pan and roast some pumpkin seeds in it. Now pour the soup into a plate with some cream on it and sprinkle some of the seeds over the soup. Bon appétit!